He would know. Described as the “dean of climate scientists,” Broecker is credited with pop­ularizing the phrase “global warming,” which he first used in a 1975 article that accurately pre­dicted the current climb in global temperatures as a result of rising carbon dioxide levels. A pio­neer in the use of radioisotope dating to deduce historical climate patterns, Broecker developed the concept of the “great ocean conveyor,” a loop of deep ocean currents that circulates water, heat and materials around the world. He was the first to offer an explanation for abrupt climate change and articulate how the oceans, rather than just the sun, affect the earth’s climate. 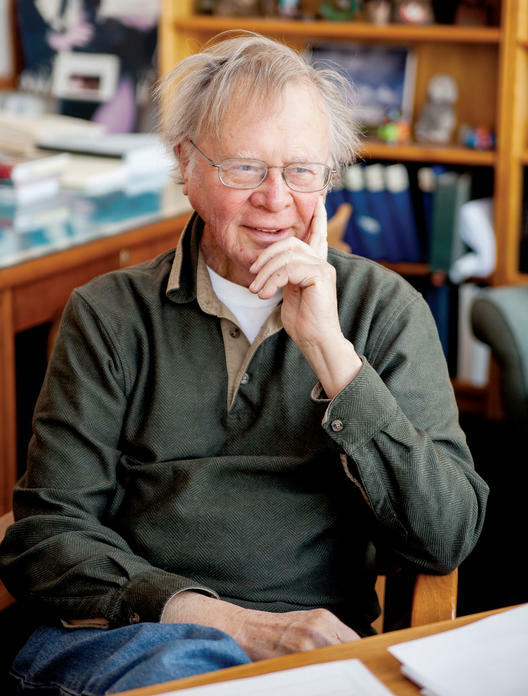 A Columbia faculty member for 54 years, Broecker is the New­berry Professor of Geology in the Department of Earth and Envi­ronmental Sciences, a scientist at Lamont-Doherty and an Aca­demic Committee member at the Earth Institute. He has taught everything from advanced geology courses at Lamont-Doherty to the Frontiers of Science course for first-year students, a part of the Core Curriculum. He has written more than 460 scientific articles and is the author or co-author of 10 books. For his work in geochronology, radiocarbon dating and chemi­cal oceanography, Broecker has won international acclaim. In 1996, President Bill Clinton awarded Broecker the National Medal of Science, the nation’s highest scientific award, in recognition of his “pioneering contributions in understanding chemical changes in the ocean and atmosphere.” Broecker has testified before Congress and been profiled or interviewed by The New York Times, The Guard­ian (UK), Smithsonian Magazine, Foreign Policy, Business Week, PBS, the BBC and the CBC, among others. In 2007, he was elected to the Royal Society, London, signing his name in the same register that Sir Isaac Newton did more than three centuries ago. Not bad for someone who describes himself as a “do-what-you-have-to student,” who ended up at Columbia almost by ac­cident and who originally planned to become an actuary. To hear him tell it, Broecker was an indifferent student, more in­terested in sports and practical jokes than in academics. (He once surreptitiously showered an unpleasant librarian with a boxful of mothballs.) But he did gain a solid foundation in calculus and physics that would serve him well later on. And he forged some important connections, notably with his “big brother,” Paul Gast ’57 GSAS, an upperclassman at Wheaton who became an impor­tant friend and mentor. The idea of becoming an actuary came from a magazine article that Broecker read while waiting in a dentist’s office. When he told Gast, who had been encouraging Broecker to think about his future, his friend was appalled. “Do you have any idea of how boring that would be?” he said. 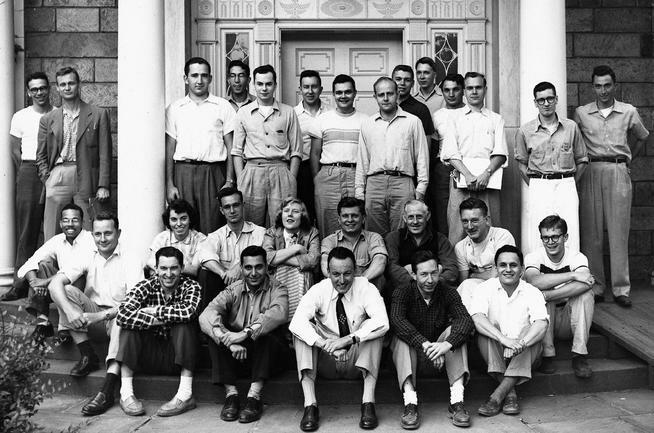 Instead, Gast encouraged Broeck­er to interview with a young geochemistry professor, J. Laurence Kulp, who was conducting research at Columbia at what was then called the Lamont Geological Observatory in Palisades, N.Y. (Gast had interned with Kulp the previous summer.) A winter break interview during Broecker’s junior year led to a research appointment at Lamont for the following summer. He worked in Lamont’s radiocarbon counting laboratory, at that time one of a handful of labs in the world conducting such research. “I never dreamed I could get into Columbia,” Broecker says. But he followed Kulp’s suggestion and wrote out a transcript of his Wheaton courses. Kulp took it to the University registrar the next day and got Broecker admitted on the spot. “It was really rather amazing,” Broecker says. Broecker’s tuition was waived because he became Kulp’s re­search assistant, which also provided a meager income to support Broecker and his wife. He spent most of his senior year studying physics, though he did take his first geology course, with Profes­sor Walter Bucher, a renowned structural geologist. But as some­one who lived near Lamont, driving to campus when necessary, Broecker bypassed the traditional Columbia College experience. “I didn’t have to take the Core Curriculum and I was never asked to pass a swimming test,” he says. Broecker graduated with a bachelor’s in physics and imme­diately entered graduate school at Columbia, working as Kulp’s research associate before earning his doctorate in geology in 1958. With Kulp’s assistance, Broecker joined the faculty of the Depart­ment of Geology as an assistant professor in 1959. Anyone who imagines scientists working quietly in a laboratory or in front of a computer hasn’t met Wally Broecker. A chance encounter at a 1950s aca­demic conference on radiocarbon dating led to an impromptu field expedition to Nevada’s Great Basin with another conference participant. The trip marked the begin­ning of Broecker the field researcher; he has taken part in scientific expeditions in the Atlantic and Pacific Oceans, the Bahamas, the Sierra Nevadas, the California coast, Barbados, Greenland, Canada — indeed, all around the globe. This capacity to understand both apples and oranges was piv­otal in what, to popular audiences, is Broecker’s claim to fame: his work on global warming. For the first two decades of his pro­fessional career, Broecker had been primarily interested in how the oceans absorbed CO2. Then a Danish scientist published a pa­per about borings from the Greenland ice cap; the deep cylinders of ice, which had been drilled from the cap, enabled scientists to track CO2 trapped in the ice and determine a precise chronol­ogy of periods of heating and cooling. Those results prompted Broecker to begin examining the effects of CO2 in the atmosphere. In the 30 years leading up to the Danish study, Greenland had ex­perienced a period of cooling, but Broecker realized the trend was temporary and that rising CO2 levels in the atmosphere would soon inaugurate an extended period of global warming. “I was just goddamned lucky,” Broecker says. Lucky or not, Broecker had helped set the parameters of the question. He quickly became hailed as the father of “global warm­ing.” Not wanting to be typecast (“I didn’t want ‘global warming’ on my tombstone,” he says), Broecker later offered his students a $275 bounty to locate an earlier use of the term. It didn’t take them long to find that the late New York Times columnist William Safire had one, a 1957 report from a local In­diana municipality, which was in turn reporting on the work of an unnamed scientist. But that usage had not stuck; Broecker’s had. So while the cogno­scenti sometimes note that Broecker popularized “global warming,” or first used the term in a scientific paper, most just credit him for coining it. Broecker continues to caution about global warming. In a mem­orable phrase from the early 1990s, he described the world’s cli­mate as an “angry beast” that we’re continuing to poke through growing emissions of CO2. “My point was that by adding large amounts of CO2 to the atmosphere, we were poking our climate system without being sure how it would respond,” he says. 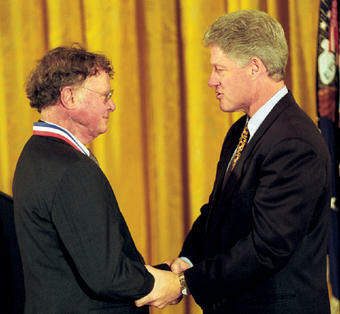 President Clinton presented Broecker with the National Medal of Science, the country's highest scientific award, in July 1996. Photo: Courtesy William J. Clinton Presidential LibraryAnd he’s unsure about the future. More CO2 was discharged into the atmosphere in 2011 than in any other year, but so far, he notes, the United States has only spent $10 million on research and development of technologies to address the problem — “less than [the salary of] one Yankees pitcher in one season.” Skeptical about the acceptance of alternative energies, Broecker has come out in favor of systems to capture and store CO2, including an air cap­ture system proposed by Klaus Lackner, Columbia Engineering’s Maurice Ewing and J. Lamar Worzel Professor of Geophysics. He favors experiments under way in Norway and Iceland to store CO2 underground and has proposed experiments to test undersea CO2 storage, though he notes these face intractable opposition from Greenpeace and other environmental groups. It’s not an accident that most of these experiments are taking place overseas. In the U.S., Broecker has been a prime target of what he describes as a “well-funded political campaign” attempt­ing to deny the reality of global warming. “They call me a ‘junk scientist’ to my face,” he says. Nevertheless, he insists, “The debate is false. One of the main drivers of ice ages was the CO2 content in the air. When the CO2 was lower it got plenty colder. So, as we add CO2 it’s going to get a lot warmer. “There can be a question about how big the warming will be, but there’s no doubt in my mind” that warming has occurred, he says. Despite the recognition from his work on global warming, Broecker doesn’t think of it as his most im­portant scientific achievement. “In global warming, I’m an educated amateur,” he says. In the early 1980s, borings in the Arctic icecap showed results similar to those taken in Greenland. Broecker set himself the challenge of explaining dramatic swings in global tem­peratures revealed in the ice. His cru­cial insight was to focus on the role of oceans. Earlier scientists had posited a belt that carried warm upper-ocean water to the North Atlantic, where it cooled, became denser and sank to the deep ocean. According to the model, currents then carry the water to the South Atlantic, where it shuttles around the tip of Africa into either the Indian Ocean or the Pacific, where it warms and is carried back to the North Atlantic, repeating the process. Unlike earlier scientists, Broecker was able to quantify the amount of water carried by what he dubbed the “great ocean conveyor.” More impor­tantly, he showed why it mattered. Broecker had the revelation that in­terruptions in the conveyor — which could be caused by a sudden influx of fresh water into the North Atlan­tic — and subsequent restorations of the conveyor pattern in the Atlantic could explain abrupt events of cooling and warming that were recorded in the fossil ice record in Greenland and the Arctic. “It is a global system of currents, which carries a lot of heat and affects the climate of the planet,” Broecker says. “I found that circula­tion reorganizing in the ocean led to huge changes in sea ice cover, and those in turn affected almost everything on the planet. They shifted the tropical rain belts, and they warmed and cooled the high latitudes in the north.” While earlier science pointed to changes in the earth’s orbit to explain climate, “it turns out you need to couple that with these abrupt changes to make the full story,” he says. He published his initial theory in Natural History magazine in 1987. “No one was thinking of abrupt climate change” before this work, he notes. “I would have to rank it my No. 1 accomplish­ment by quite a bit.” And his conveyor research dovetails with his work on global warming, which holds the potential to disrupt the conveyor, with uncertain results. Broecker has described his findings, along with how he ar­rived at them (missteps and all) in his 2010 book, The Great Ocean Conveyor: Discovering the Trigger for Abrupt Climate Change. Broecker has managed to accomplish all this without many of the modern accoutrements of academic life. He doesn’t use a computer, preferring to write as he always has, in pencil on sheets of plain, unruled white paper. Co-workers transcribe his notes and answer his email. “I’m kind of spoiled,” he admits. His one concession to modern technology is that he now uses a mechanical pencil rather than a traditional No. 2, though an electric pencil sharpener still rests smack in the center of one of his two large conference tables, both covered with books and papers, in his office in the Gary C. Comer Geochemistry Building at Lamont-Doherty. That building itself is a testament to Broecker’s wide influence. In 2002, the late Gary Comer, founder of Lands’ End clothing re­tailer, wrote to Broecker. Comer, who had just sailed his yacht though a Northwest Passage no longer choked with Arctic ice, wanted to learn more about global warming and its link to fossil fuels. After a visit with Broecker, Comer decided to pump $60 million into climate change research. This included an $18 million gift to help build the building that bears his name, which opened in 2009, and a fund to support climate researchers and students. Broecker’s computerless office offers an eclectic travel log of his extraordinary career as well as an homage to the college prankster. A 10-foot stuffed snake, rescued from a roadside as a stand-in for the angry climate beast, adorns the wall leading to his office, which is guarded by a garden lion statue. A 5-foot-tall cardboard cutout of Elvira, Mistress of the Dark, with a photo of Broecker’s face pasted over Elvira’s, shares a wall with a bookcase containing a certificate marking his selection to the Royal Society. The bookcase also hous­es a photo taken at the 800th anniversary of the founding of Cam­bridge, where he received an honorary doctorate (he’s pictured just behind Prince Philip and next to Bill and Melinda Gates). His prodigious scholarly output hasn’t stopped Broecker from being a favorite of Columbia students, undergraduate and gradu­ate. Although his base of operations has been Lamont-Doherty, Broecker has taught regularly on the Morningside campus as well. Originally, he shared many teaching and administrative respon­sibilities with his mentor, Kulp. Later, when Kulp left Columbia to devote himself full-time to a company he started, Broecker worked with his friend Gast, who had also earned a doctorate at Columbia. In the late 1960s, Broecker taught the introductory geology course at Barnard after the professor who had taught the course abruptly resigned. His prodigious scholarly output hasn’t stopped Broecker from being a favorite of Columbia students. “He has a great concern for students. I think that’s one of his great strengths,” says George Denton, professor of earth sciences at the University of Maine, who started working with Broecker in the early 1970s. Broecker’s teaching also contributed to his own writing. His first textbook, Tracers in the Sea (1982), on the chemistry of the ocean, was described in The New York Times as standard reading for scientists who use chemical clues to understand climate.” The book is long out of print but Broecker notes with satisfaction that copies are selling on Amazon for as much as $450. His How to Build a Habitable Planet was the outgrowth of a course he taught in the early 1980s. In 2012, Broecker published a revised edition, now co-authored with Charles Langmuir, a Harvard professor. Broecker also played a role in the development of Frontiers of Sci­ence, the Core Curriculum course introduced by the College in the early 2000s. While the course was in its initial stages, he developed modules on climate change for the trial sections held in Miller The­atre. He continued to teach these modules when Frontiers became a required part of the Core, though he declined to teach discussion sec­tions because he didn’t want to have to master the other disciplines taught in the course. “Too much new stuff to learn,” he says. from being a favorite of Columbia students. Broecker has remained at the top of his field. He has been elected a member of the National Academy of Sciences and the American Academy of Arts and Sciences as well as a fellow of both the Ameri­can and European Geophysical Unions. In addition to his National Medal of Science and Royal Society induction, he’s garnered just about every award imaginable for a geoscientist, notably the Vetle­sen Prize, widely considered the geoscience equivalent of a Nobel Prize. In 2009, Broecker was awarded the Frontiers of Knowledge Award in Climate Change, one of the world’s largest science prizes, from Spain’s Banco Bilbao Vizcaya Argentaria Foundation. Now 80, Broecker shows little sign of slowing. Before being interviewed for this story, he had just returned from teaching a 7½-week course at Arizona State University in Tempe. This year, Geochemical Perspectives, a new journal published by the European Geophysical Union, will devote only its second issue to a single author: Wally Broecker. His contribution, “The Carbon Cycle and Climate Change: Memoirs of My 60 Years in Science,” is essen­tially an intellectual autobiography, recounting his triumphs and stumbles on the way to his major discoveries. Grace Broecker died in 2007. Their six children have produced eight grandchildren and five great-grandchildren. Broecker has since remarried to Elizabeth Clark, with whom he works at Lamont-Doherty. Though Broecker had made New Jersey his home for decades, the couple now lives on Riverside Drive near the Morn­ingside Heights campus, making the short reverse commute to Lamont-Doherty. He stays active by walking 30 minutes each day. “I can pass for under 70 with no trouble,” he gently brags. Read Broecker’s op-ed on the direct air-capture of CO2. Timothy P. Cross ’98 GSAS, a former CCT associate editor, is a free­lance writer living in Brooklyn, N.Y. Robert E. Calem also contributed research to this story.